Why did you abandon your IRS application? After investing a great deal of time completing the IRS application and almost a year waiting for their review, the IRS sent us a letter requiring that we re-organize Fr33 Aid as a C-Corporation. Fr33 Aid is currently an LLC, and apparently only certain types of LLCs are eligible for tax-exemption under IRS rules. Re-organizing as a C-Corporation would require significant additional time and government fees. Now that there are ways for us to do banking without government involvement, we decided fulfilling this demand would not be a responsible way for Fr33 Aid to spend its money nor for our volunteers to spend their time. Why did you file for IRS recognition in the first place? As explained in my talk at AltExpo X, the main reason we filed the application was due to the lack of banking options that existed in early 2011. We wanted Fr33 Aid to have its own, auditable account for financial operations. Specifically, we wanted to be able to make online payments and reimburse volunteers for expenses, and we wanted to accept donations in various forms. When we started Fr33 Aid, we couldn’t find any bank that would provide us these services unless we provided evidence of our IRS taxpayer ID number and state paperwork proving that Fr33 Aid was an entity recognized by state government. Does Fr33 Aid still have a bank account? Yes. Since our bank doesn’t charge any fees and doesn’t have a minimum balance requirement, we see no reason to close our account at this time. We keep our account with a small local bank where the bankers are friendly and recognize me on sight. We maintain only a few dollars there now. Meanwhile, maintaining our bank account enables us to continue accepting donations via check, credit card, PayPal and Dwolla for now. This is subject to change in the future, and we don’t consider any of these payment methods as trustworthy as direct bitcoin donations. In future, any donations we receive via traditional banking methods will be converted to bitcoin in a timely manner. Does this mean Fr33 Aid isn’t a non-profit anymore? No. Everyone at Fr33 Aid is a volunteer, and no one is an owner or employee. What Bitcoin technologies and services does Fr33 Aid use? Many people have volunteered to help us with Bitcoin. Mike Gogulski of nostate.com helped set us up to accept bitcoin donations in late 2011. Recently, Matt Whitlock of Lamassu Bitcoin Ventures advised us about bitcoin technologies and settings that helped us meet the broader requirements associated with eliminating our dependence on traditional banks. Davi Barker and Drew Phillips of Bitcoin not Bombs are helping us integrate bitcoin into our fundraising plans, graphics, website and public relations activities. 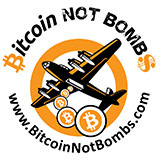 Bitcoin not Bombs is also organizing our exhibit at the Bitcoin Conference in May, which we will be sharing with Anti-war.com and the Free State Project. After our blockchain.info wallet was hacked, we no longer publicly state the bitcoin technologies we use for security reasons. Why did you choose Bitcoin for your financial operations? 1) Ability to conduct a variety of financial transactions. 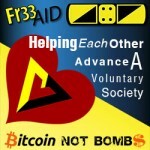 Fr33 Aid has accepted online bitcoin donations and offered our volunteers reimbursement in bitcoin since late 2011. Now that Bitcoin has been around a few years, it’s relatively easy to convert bitcoin into any currency, and vice versa, without traditional banks, both online and in person. To date, Fr33 Aid has received most of its donations in cash at events like PorcFest. This year, Lamassu will bring a Bitcoin ATM to PorcFest, where Fr33 Aid donors can insert their cash and send it to Fr33 Aid’s bitcoin address. For anyone who still wants to donate directly to Fr33 Aid in cash, we can easily put their donations through the Bitcoin ATM ourselves, eliminating our need to carry cash back to our bank for a deposit. On the expense side, more and more companies are accepting Bitcoin in exchange for goods and services. For example, BitMit offers a wide variety of products for bitcoin, and the Bitcoin Store offers electronics and accepts only bitcoin. We believe the day is coming soon that we can directly purchase first aid and educational supplies in bitcoin. Until then, donors may send us supplies we need directly from our Amazon wish list, and there are a number of Fr33 Aid volunteers who are happy to accept bitcoin as reimbursement for Fr33 Aid expenses. 2) Ability to Hold Its Value. The way Bitcoin was designed makes it behave in predictable ways over the long term, much like gold and silver. No one can increase the supply of bitcoin beyond what the open source protocol allows for, and governments all over the world can create more of their own currencies whenever they want. This causes us to believe the value of bitcoin will continue to rise in terms of government-issued currencies, much like gold and silver. We also believe that the more people who realize Bitcoin’s inherent value of allowing for anonymous transactions, the more the value of bitcoin will rise. 3) Security and Continuity. There are ways to keep bitcoin safe via technologies like 2-part authentication and offline wallet modes, even paper wallets that can be stored in fireproof safes. These technologies enable each bitcoin address holder to be the only person with access to that address. With bitcoin, there is no one to appeal to in case a private key or wallet passphrase is lost, or in case the bitcoin holder is incapacitated. This creates a new requirement for continuity plans in case something happens to the bitcoin address holder. Because Bitcoin depends on the internet, one potential drawback to asset continuity with bitcoin is a scenario in which the internet may no longer be available. Fr33 Aid spends most of its assets shortly after donations are received, because we believe this is the responsible way for a charity to behave. However, if in the future we decide to do a big, long-term project that would require us to accumulate capital over a year or more, we would likely convert some of our bitcoin to gold. 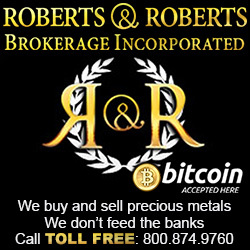 Tim Frey at Roberts & Roberts Brokerage, a long-time sponsor of Fr33 Aid, told me he’d accept bitcoin for gold, which would enable us to avoid banks if we would like to do so. 4) Transparency. We believe charity organizations should be transparent about their assets and financial dealings and subject to audits by their board of directors and other entities. Although it’s possible to work anonymously with Bitcoin, the Bitcoin protocol allows for great transparency. Fr33 Aid publishes its bitcoin address, and we’ve also tagged it with our website. 5) Last but not least: Bitcoin allows us to do business without government or traditional banks. Fr33 Aid prefers to do business only with people and organizations whose actions are consistent with the non-aggression principle. Bitcoin gives us more control over who we do business with. Have you considered any other alternative currencies like LiteCoin or Ripple? We’ve heard good things about LiteCoin and Ripple and we’re beginning to check these out. Fr33 Aid has accepted donations and provided reimbursements in a variety of silver rounds, silver dime cards, Shire Silver and other currencies. We are excited by the wide variety of alternative currencies and related technologies that are popping up. Where can I learn more about Fr33 Aid and your decision to operate without traditional banks? To learn more about us, check out our “About” page and follow us on Facebook and Twitter. Anyone is welcome to submit a question to us via our “Contact us” page. In addition, Fr33 Aid’s Director of Operations Stephanie Murphy and our Treasurer (that’s me, Teresa Warmke) will participate in a panel about Bitcoin for Non-profit Organizations at the Bitcoin Conference in San Jose, along with Angela Keaton of Anti-war.com and Carla Gericke of the Free State Project. Our talk is tentatively scheduled for 9 am on May 19.